TOKYO, Mar, 05 2019 - (JCN Newswire) - Showa Denko (SDK; TSE:4004) resolved at a Board of Directors' meeting today to make a partial revision of its existing director compensation scheme, a performance-linked stock compensation scheme called Board Benefit Trust (BBT) (the Scheme) utilizing a trust service. (The trust established through the entrustment of funds on the basis of a trust agreement between SDK and Mizuho Trust & Banking Co., Ltd. concerning the Scheme is hereinafter referred to as "the Trust.") Following the resolution today, SDK will include its Councilors in the Scheme and revises the maximum amount of funds the Company will contribute to the Trust, which are to be used by the Trust to acquire shares in SDK. SDK originally announced its plan to introduce the Scheme on February 10, 2016, and officially resolved introduction of the Scheme at the 107th ordinary general meeting of shareholders held on March 30, 2016 ("the General Meeting of Shareholders"). Following this resolution, SDK ("the Settlor) made a trust agreement with Mizuho Trust & Banking Co., Ltd. ("the Trustee") and started to entrust funds to the Trustee. 1. Changes in beneficiaries of the Trust and the maximum amount of funds SDK will contribute to the Trust to acquire shares in SDK. SDK originally introduced the Scheme for three financial years from the one ending December 31, 2016 to the one ending December 31, 2018 (this period of three financial years, as well as each subsequent period of three financial years, are hereinafter referred to as "Target Period") and for each of subsequent Target Periods. Following the Resolution, starting from the Target Period from the financial year ending December 31, 2019 to the one ending December 31, 2021, SDK will contribute up to 550 million yen (including 288 million yen for Directors) as additional contribution to the Trust for each of the Target Periods until the termination of the Scheme, as funds to acquire shares in SDK. If, however, in the event of SDK making such additional contribution, the trust assets contain any residual SDK shares (excluding shares yet to be granted to Directors, Corporate Officers and Councilors among SDK shares corresponding to the number of points assigned to such executives) or any money ("Residual Shares and Cash Benefits") on the last day of the Target Period immediately preceding the Target Period for which SDK intends to make the additional contribution, the combined total value of the Residual Shares and Cash Benefits (the applicable value of the SDK shares shall be the amount of their book value on the last day of the above-mentioned immediately-preceding Target Period) and the money to be additionally contributed shall be an amount not exceeding 550 million yen (including 288 million yen for Directors). At present, however, SDK does not have any plan to additionally contribute money to the Trust to acquire shares in SDK during the three-year Target Period starting from the financial year ending December 31, 2019 due to the increase in numbers of beneficiaries of the Scheme following the change described in item (1) above. i. SDK will obtain the approval of the General Meeting of Shareholders and Board of Directors' meeting for the director compensation under the Scheme, and establish the Director Share Grant Regulations within the scope of the framework approved at the meeting concerned. ii. SDK will entrust funds to the Trustee within the scope approved by the resolution of the General Meeting of Shareholders and Board of Directors' meeting stipulated in item (i) above (the trust to be established through the entrustment of funds is hereinafter referred to as "the Trust"). iii. The Trust will use funds entrusted to it, as stipulated in item (ii) above, as underlying funds to acquire shares in SDK by way of the stock market or by underwriting shares of SDK's treasury stock. iv. SDK will grant applicable points to Directors, Corporate Officers and Councilors pursuant to the Director Share Grant Regulations. v. The Trust, obeying instructions from the trust administrator independent from SDK, will not exercise the voting rights of SDK shares held in the trust account. vi. 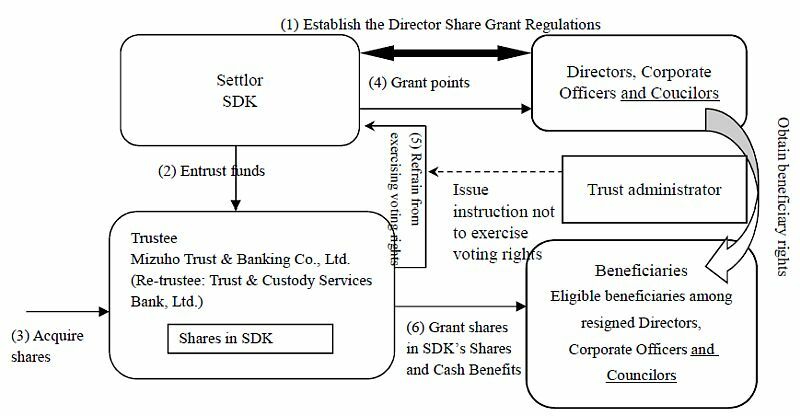 The Trust will grant shares in SDK to each of the resigned Directors, Corporate Officers and Councilors meeting beneficiary requirements set forth in the Director Share Grant Regulations ("Beneficiaries"), based on the number of points assigned to the beneficiary; provided, however, that, with regard to a certain portion of the points, the Trust will pay an amount of money corresponding to the prevailing market price of SDK shares to any Director or Corporate Officer meeting relevant requirements set forth in the above-mentioned regulations.